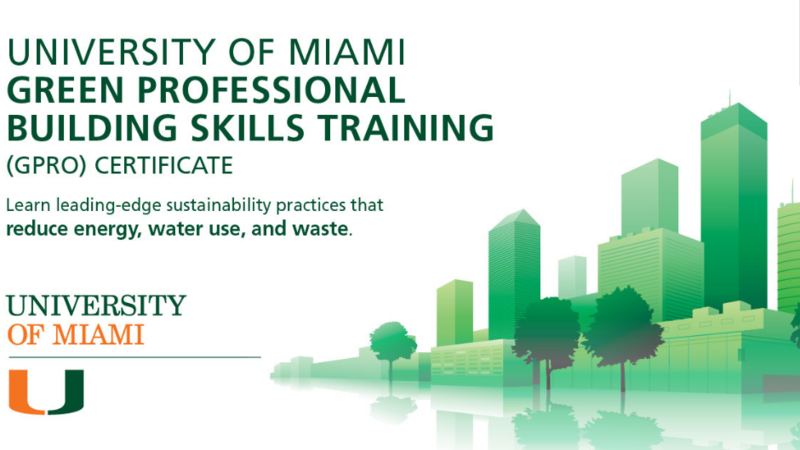 A new green building certification program—offered through a unique collaboration involving Miami-Dade County, the University of Miami and the Urban Green Council—will teach industry professionals leading-edge techniques to reduce waste and pollution, make buildings more efficient, lower operating costs, and leave a better green footprint. Customized for South Florida’s specific climate and regional needs, the Green Professional Building Skills (GPRO) Certificate Program is the only authorized program of its kind in the state of Florida. In Miami-Dade County, where buildings are the No. 2 source of pollution, and they waste an average of 30% of the energy and water they consume, this program is particularly critical. The 14-hour non-credit certification program (12 hours of instruction followed by a two-hour exam) will be taught by GPRO-certified University of Miami faculty and Miami-Dade County staff. The program will be held on the University of Miami’s Coral Gables campus in April. GPRO training and credentialing were developed by the Urban Green Council, an affiliate of the U.S. Green Building Council, which reviews projects around the world for LEED certification. Miami-Dade County’s Office of Resilience, part of the Department of Regulatory and Economic Resources, was a crucial collaborator in designing the GPRO Certificate Program. The program's curriculum aligns with the County’s resilience and sustainability initiatives, including the Building Efficiency 305 (BE 305) Program, which promotes improvements in building performance through programs and policies that increase energy and water efficiency in existing large buildings. Many municipalities across the country already require building owners to track and benchmark water and energy consumption, and trained professionals are needed to gather and interpret the data. Developed for professionals who build, renovate or maintain high-rise commercial and multi-family residential buildings and condominiums, GPRO is recognized as North America’s top program for teaching both the principles of sustainability and resilience and the techniques needed to implement those principles immediately. Tuition for the GPRO certificate program is $1,995, with an additional $195 for course materials and the certification exam fee. Professionals can register for the program online. Custom training for organizations and discounted tuition waivers are available for large groups. The Division of Continuing & International Education at the University of Miami offers credit and non-credit academic programs to high school students, undergraduates, international students, professionals, and organizations. For more information about the GPRO Certificate program, please call 305-284-4000 or visit www.continue.miami.edu/GPRO. The University of Miami Master of Science in Construction Management program is a practice-oriented advanced graduate degree that offers a blend of construction and business management courses. Offered through the College of Engineering, this degree program is designed to develop leaders and managers for complex building projects, with mastery in best practices related to resiliency, sustainability, building information modeling, project delivery and decision-making. For more information, call (305) 284-2404 or visit www.coe.miami.edu/construction-management. Miami-Dade County's Office of Resilience assesses and prioritizes the community’s vulnerabilities and collaborates both internally with county departments and externally with government agencies, universities, business groups, nonprofit organizations, and other stakeholders to effectively facilitate countywide resilience and environmental sustainability. For more information, call 305-375-5593, email green@miamidade.gov, or visit the website at www.miamidade.gov/green. Urban Green Council is the New York affiliate of the U.S. Green Building Council (USGBC). Our mission is to transform NYC buildings for a sustainable future. A non-profit organization established in 2002, Urban Green is funded by contributions from foundations, its members and corporate sponsors. Our in-house experts and a dedicated network of volunteers are helping to transform the built environment in New York City with models that can be replicated in urban centers nationwide. GPRO is a comprehensive national training and certificate program developed by Urban Green Council. For more information, please visit www.urbangreencouncil.org.